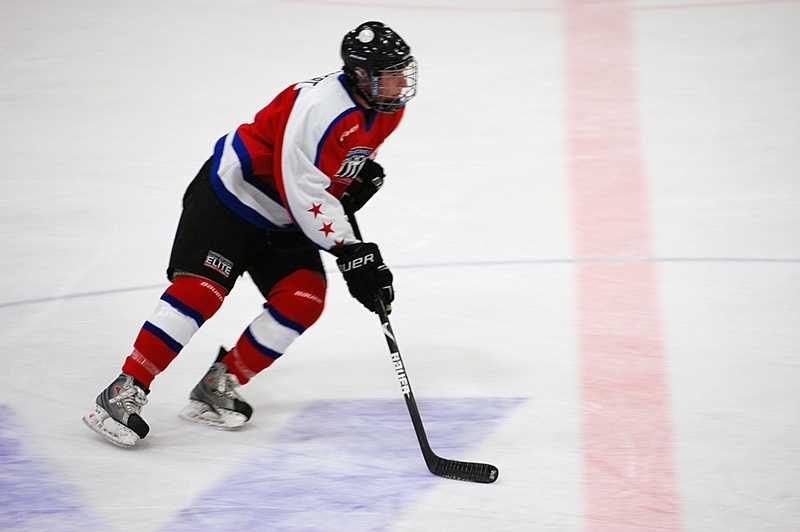 NEW HOPE ---- As the leading scorer in the Upper Midwest High School Elite League ---- Minnesota hockey’s version of Top Gun ---- Caleb Herbert established himself this fall as the sort of player who only gets more revved up as the games get faster. Put simply, Herbert is the best of the best. The elite. Don’t get the wrong idea, though. Herbert’s game is far from one-dimensional. On Saturday in the Red team’s 5-1 blowout of Team Minnesota White in the semifinals of the Bauer National Invitational Tournament at New Hope Arena, the Bloomington Jefferson senior scored a masterpiece of a goal that required large amounts of hockey smarts and deft stickhandling but none of that Mach 5 skating speed. While cruising through the crease in the third period, Herbert pounced on a loose puck and, after a dizzying array of zigs, zags and head fakes, deposited the puck into a wide open net. That goal put the Red team ahead 4-0 just more than 5 minutes into the third period. Herbert, described by Toomey as sometimes being too unselfish, would have you believe it was a happy coincidence that he, the puck and an empty net all converged in the same time and space. A look at the stat sheet, however, reveals that sort of thing happens on a routine basis for the UM-Duluth recruit. Heading into the elite league postseason, the 5-foot-9, 180-pound center had 13 goals and 24 assists for a league-best 37 points. On Friday in a 5-0 win over Team Wisconsin, he assisted on both of linemate Zach Shroeder’s goals. The unit of Herbert, Schroeder and Justin Crandall (Schroeder and Crandall both play for St. Thomas Academy) was dominant again Saturday in helping the Red team outshoot the White by an astounding 60-23. Team Minnesota Red plays Shattuck-St. Mary’s at 1:30 p.m. at New Hope Arena in Sunday's championshp game. Shattuck-St. Mary’s beat the Michigan Developmental Hockey League team 7-1 in Saturday’s other semifinal. Late in Saturday’s Team Red triumph, Herbert won a face-off in the Team White zone and headed straight for the net. He took a shot that hit the post. His pace hadn’t slowed a bit.